Fishing Los Angeles Saltwater and Bays. Saltwater fishing in the greater Los Angeles area can be exciting and productive. 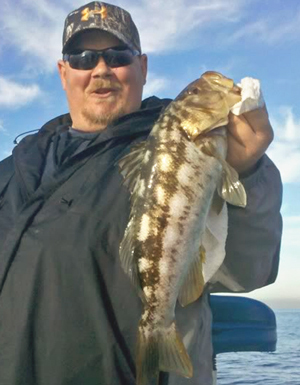 Whether you are pulling a hard fighting Spotted Bay Bass from under a dock in Newport, bouncing a White Seabass up from a reef near Dana Point, or yanking a Calico Bass out of the boiler rocks of Palos Verdes, L.A. has some great fishing to be had. Because of his tournament experience, time on-the-water, and general knowledge of the Los Angeles saltwater scene, you can fish Los Angeles Saltwater with confidence, knowing that Captain James Nelson will put you on fish. The exact areas fished, and species willing to bite are usually seasonal, so please call for specific information. Base rate is for Harbor, and Coastal Fishing; add for off shore, or island trips. There's no reason to go on a crowded open party boat, when you can enjoy the luxury of a private fishing guide with personal service. James Nelson Professional Fishing Guide Service will not only take you to the best privately guided fishing Los Angeles saltwater has to offer, but we also provide for you all the necessary baits; lures, tackle, rods, reels, snacks, and soft drinks, to help make your Los Angeles saltwater adventure that much better. Captain James Nelson has been fishing Los Angeles saltwater for over 20 years. Fish with James once, and you will never fish Los Angeles the same.